This article explains the principle of galvanic isolation of the Universal Serial Bus and the advantages of using USB isolated USB IO Modules. USB devices are connected via an USB cable with the host computer. The host computer supplies the USB device with power and communicates with it via the conductive lines. This principle is shown in the figure below. In this example the Lucid Control USB Analog Output Module is used in order to explain the principle of isolation of the USB. This analog output module is able to supply 4 independent voltage channels with a range of 0-10V and is programmable via USB. The Lucid Control USB IO Modules cover a wide range of different analog and digital inputs and outputs. 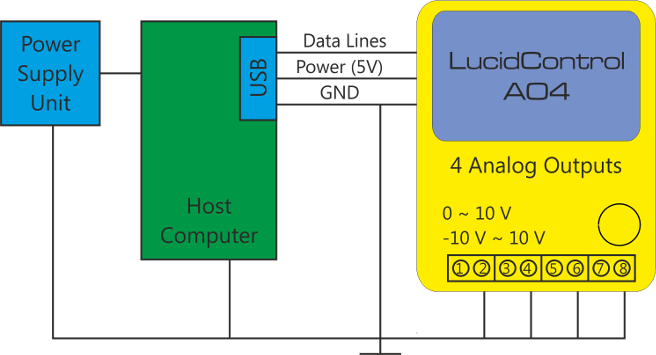 The non isolated standard version of the Lucid Control USB IO Modules are connected by a USB cable to the Host Computer. The whole system is powered by the Power Supply Unit on the left hand side. The Power Supply Unit is directly connected to the Host Computer (e.g. a Raspberry Pi) and the USB device, connected to the Host Computer, is supplied by the Raspberry Pi and in the end by the same Power Supply Unit. All signals, power and data lines, are established by a conductive connection. Electronic devices are always connected to some Ground potential which is normally the minus pole of the Power Supply Unit. In the drawing above, the Ground potential is the lower connection to which all devices are connected to. In most applications isolation of the USB interface in general. But, in harsh or noisy environments disturbances may couple into signal and communication lines. This can cause measurement errors or malfunction of the data processing equipment or the IO module. Galvanic isolation if the USB interface can improve this situation. Lets assume that the USB Analog Output Module is mounted in a switch cabinet together with the USB Temperature Measurement Module and both modules share a common ground. One analog 0-10V output is used in order to control a pump. The pump is outside the switch cabinet and 10m of cable is between output and pump. Next to the pump is a Pt1000 RTD located measuring the temperature of the water flowing through the pump. Both channels, the analog output channel and the RTD input channel are sharing the same ground potential. Disturbances, which are in our case caused by the power regulation circuit of the pump, may couple to the ground line and have the potential to couple to the USB Temperature Measurement Module, too. This can result in wrong temperatures being measured. The drawing above shows the same application, but here the USB Analog Output Module with Galvanic Isolation (-ISO option) is used. The -ISO option is now available for all LucidControl USB IO Modules. The connection of the Power Supply Unit and the Host Computer are identical compared to the non isolated version. The difference is inside the USB IO Module. The isolation is represented by the red barrier which isolates the USB IO module entirely from the USB data lines and power supply lines. An isolated DC/DC converter separates the power supply. The main purpose of the isolated LucidControl module is the separation of the USB IO module from the data processing equipment (e.g. the host computer). Non-Isolated USB IO modules are conductively connected to the USB port also sharing a common ground line. Another aspect is the protection of the data processing equipment from overvoltage. If for example a voltage above the limits of the module is applied to the terminals this can damage the module and the data processing equipment also. The isolation limits the possible damage to the IO module itself. USB isolation can be an option if a higher protection level required or if LucidControl USB IO modules are operating in harsh environments. Even when the isolation protects the data processing equipment from overvoltage damage it does not protect from voltages > 50V! Is galvanic isolation beneficial for your application? We are very confident of our technology and we were never be confronted with problems like instability or malfunction. You have a harsh environment and expect measurement errors or communication problems In this case you should consider high quality USB cables in a first step. If you are unsure if galvanic USB isolation is appropriate for you application, please feel free to contact us.